Info Enhancer is a potential threat to your virtual security. According to our malware researchers, the suspicious application may be offered to you using different channels. It can enter your operating system if you download software from infolooks.org, extension.infoenhancer.com, infolooks.org, or freeswdl.com. In most cases, the adware is hidden behind the Weatherbar by Null.ru and tooldev342. Also known as a TracersToolbar, the application is meant to provide you with the latest weather forecast. Even though you may be interested in this service, we do not recommend installing the software to avoid complicated malware removal operations. We certainly do recommend that you remove Info Enhancer because this advertisement-supported program is intrusive and unreliable. 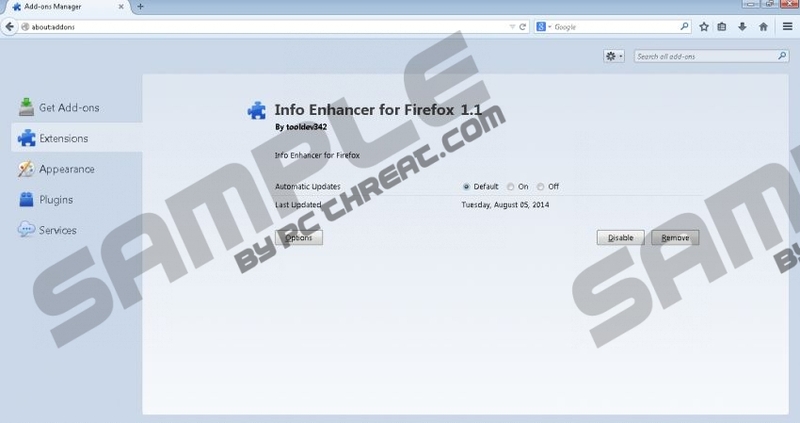 According to the recent research, Info Enhancer can be installed onto the PC using Amonetize bundles as well. If you think it is difficult to delete Info Enhancer, you probably have not been introduced to OffersWizzard, IStartSurf hijacker, SpeedupMyPc, and other suspicious applications which are often carried by Amonetize. If you have discovered any of these programs or other suspicious software, you have to scan the operating system and identify all threats that you have to remove. If you do not delete the intrusive software, your Internet connection may slow down, the browsers may be flooded with suspicious ads, and silent tracking cookies may start recording private information. Info Enhancer itself is infamous for producing suspicious banner and pop-up advertisements which cannot be removed separately from the plugin. These ads are always represented in Russian, which is why it is most likely to target those who use this language on their operating systems. These ads are completely unreliable, so you need to remove them ASAP, and you can achieve this only if you delete Info Enhancer. Do you want to browse the web without discovering new disturbing and potentially unreliable ads every time you open a new web page? If you do, you need to delete Info Enhancer and remove other advert-supported software which may have been activated without your knowledge. As mentioned before, a reliable malware scanner can help you identify all threats that require removal. Scan the operating system and determine the best way to delete the discovered threats. Even though it is possible to remove Info Enhancer manually (see guides below), we still recommend installing automatic malware removal software. It will delete malware and will help you shield the operating system against other suspicious and unreliable applications. Navigate to the Task Bar and click the Start button to access a menu. Select Control Panel and then double-click Add or Remove Programs. Locate the undesirable application, select it and click Remove. Navigate to the left of the Task Bar and click the Windows button. Right-click the program you wish to delete from the computer and select Uninstall. Right-click on the screen for a new pane to show up and click All apps. Locate the program you wish to delete, right-click it and select Uninstall. The undesirable plugin will be deleted from Internet Explorer if you complete the guides above; however, Mozilla Firefox and Google Chrome users need to complete the additional steps presented below. Launch Firefox and simultaneously tap Ctrl+Shift+A. When the Add-ons Manager is opened in the new tab – click Extensions. Identify the undesirable plugin, click the Remove button linked to it and restart the browser. Open Chrome and simultaneously tap Alt+F. In the menu on the left click Tools and then select Extensions. Click the recycle bin button associated to the undesirable plugin. Select Remove and then restart the browser. Quick & tested solution for Info Enhancer removal.